If you are looking for the best outdoor ceiling fans with lights, you will have dozens of options to choose from. This can be very confusing as many of the top-quality fixtures look stylish and are equipped with powerful motors. You can use this guide to help you make the right decision by studying the reviews of most outstanding products on the market. This exquisite model from the Litex Kingsbridge Collection would enhance the look of your covered porch, patio, or sunroom and provide you with a pleasant breeze and soft light. The blades are aged bronze and three bulbs are encased in a hammered glass light fixture that looks truly gorgeous. This would be one of the best outdoor ceiling fans with lights for those who are looking for an elegant but powerful piece of equipment. The reviewers seem to love this model greatly. They complement its looks, efficiency, and overall quality. However, some say that the hammered glass creates the ‘disco ball’ effect if you use three powerful bulbs. This can be fixed with using soft or opaque light bulbs. The Tilo from Emerson deserved its #1 position among the best outdoor ceiling fans with lights due to its extreme efficiency and stylish design. Its sleek round lines will complement your patio or sunroom. Three curved plywood blades combined with a powerful motor will keep the space cool even on a hot summer day. The dual mount allows you some flexibility, and the light fixture is highly adaptable. The wall control panel allows you to choose between 4 speeds, so you’ll be able to set the perfect airflow for any day. The Tilo is beautiful, and it’s also extremely useful. The fixture is equipped with a reversible airflow fixture and its power is sufficient to provide 2278 cubic feet per minute airflow, which makes it one of the best devices in its class. All this is available for a reasonably affordable price. According to reviewers, the Tilo is highly durable and works quietly. Its design always draws compliments, but it’s the power that makes the biggest impression on the users. Considering the blades are only 30 inches, it’s easy to see why people are surprised when they feel such a powerful airflow from the fixture. Some people complain that it’s not efficient enough to be installed on a big patio, but this depends on the location and the size of the space. This is also one of the best outdoor ceiling fans. The Key Biscayne is a true beauty produced by Hunter Fan Company, one of the leading manufacturers of the best outdoor ceiling fans with lights. Its design would look great in many modern interior styles, and burnished gray pine blades can fit into any color scheme. The blades are fairly large (54 inches), so the fan can effectively cool even large spaces. The hardware is stainless steel and all other parts have a high damp rating, so this fixture is perfect for covered porches. The Whisper Wind motor from Hunter Fan Company ensures that this outdoor ceiling fan is not only efficient but also quiet. The light kit with white glass provides pleasantly soft light and looks very stylish. It requires two standard 14W medium base CFL bulbs. Control pull chains don’t look out of place in the fixture’s design. 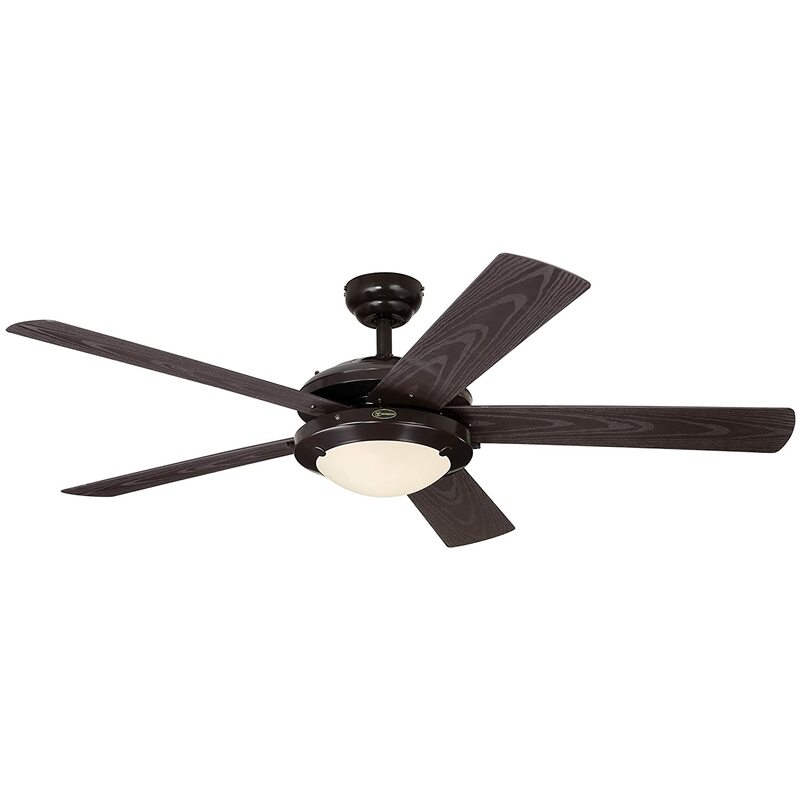 The vast majority of reviewers state that this is one of the best outdoor ceiling fans one can find. It looks gorgeous and works extremely well. The quality of the piece is very high and it’s durable. A few users had difficulties with installation, so be sure to study the instructions carefully and look up some tips online, or simply invite a professional to install the fixture outdoors. The Cabrillo Cove is the perfect fixture if you are looking to make your tropical-style porch or sunroom a much cooler place to relax in. This amazing device deserved its place among the best outdoor ceiling fans with lights due to its beautiful design. The blades in the shape of palm leaves in Distressed Bronze look truly magnificent, enhancing the décor nicely. You get an opportunity to choose between two sets of blades (weather-resistant and plain), so you can take the fan inside if you feel like it. The motor is powerful and has three speeds to ensure the maximum level of comfort in any weather. Tommy Bahama offers a lifetime warranty for the motor and a one-year warranty for the rest of the device. However, according to reviews, the durability of the piece is so high, it will serve you well much longer. It requires very little care and is easy to install. It’s also very flexible mount-wise and includes a 4.5’’ and a 18’’ downrod, so the fixture can be installed almost anywhere. The amber Mist Glass securely protects the bulbs and users claim that the device looks even more beautiful when lit. There are a few complaints about the installation of the electric fixture, so be very careful and study instructions if you plan to do this on your own. Double-check every connection before turning the fan on for the first time. The Curva Sky would be a beautiful addition to your home. 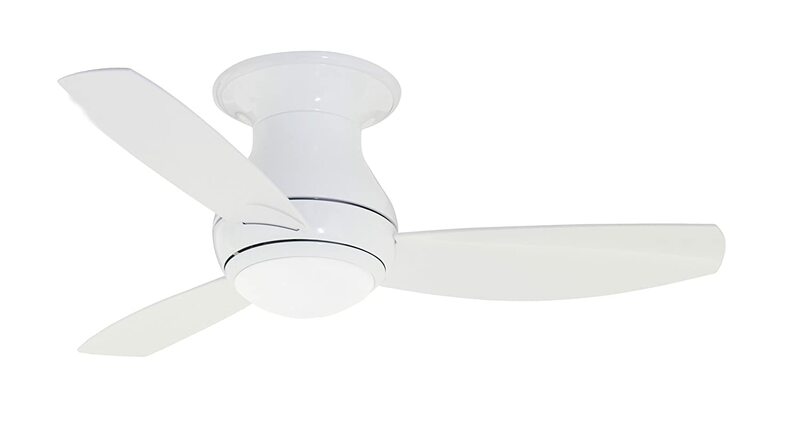 This 44-inch fan is white, sleek, and stylish. It looks great in modern interiors. 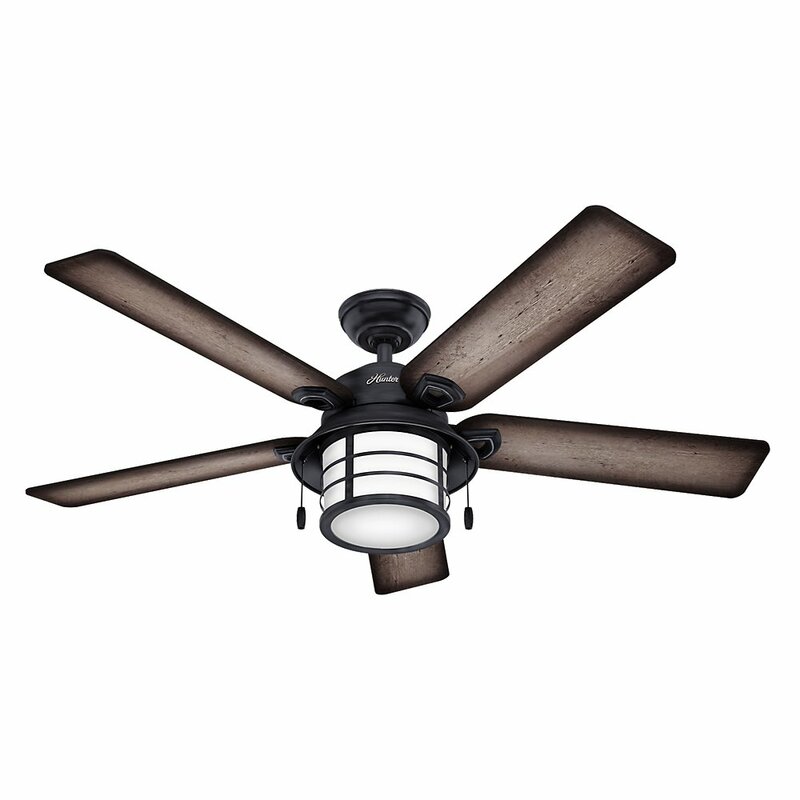 As one of the best outdoor ceiling fans with lights, this model from Emerson offers a load of quiet power delivered by a reliable motor. You also get a 6-speed remote control, so you’ll have a perfect setting for any day. The integrated light fixture offers soft light from two 50W halogen bulbs that are included in the set. The Curva Sky also has a ‘no light’ plate you can use if you want to remove the lights for some reason. The highly durable device is perfect for outdoor spaces because of its high weather resistance rate and powerful motor. It will ensure you stay comfortably cool even on a large covered porch. The motor has a limited lifetime warranty. The vast majority of reviewers love this model because it looks cool and keeps you even cooler. It’s energy efficient and offers great value for your money. We discovered a few complaints from users who can’t change the light brightness. Note that this feature is present, you just need to press and hold the light button as described in the instruction. Available in four beautiful color schemes, this model of the Comet from Westinghouse can fit into any interior. The 7200700 variety can be used both indoors and outdoors. Its 52-inch blades will cool down the area as large as 360 square feet. It’s definitely one of the best outdoor ceiling fans with lights if you are looking for a durable and stylish piece at a reasonable price. The motor is one of the most outstanding features of the Comet. It’s reliable and extremely powerful. A lifetime warranty provided by the manufacturer, and the rest of the device is covered for two years. 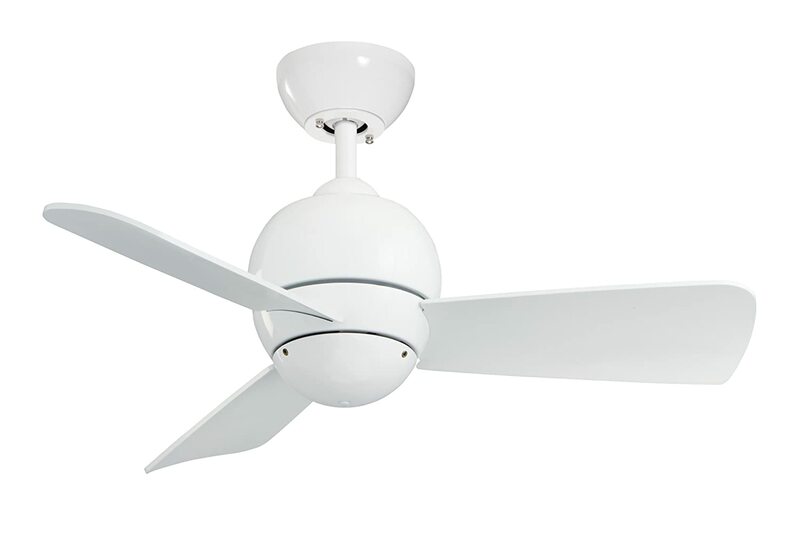 According to reviewers, the Comet is a durable and efficient ceiling fan, regardless of whether it’s installed indoors or outdoors. It offers everything you could expect from a unit of this price category and actually looks more expensive. A few people complain about the noise on the highest speed level, but this issue can be caused by incorrect installation or balancing. This can also be used in the bedroom and hence its included in my list of best ceiling fans for bedrooms. First of all, you need to understand that an outdoor fan is different from designed for indoors only. These fixtures must be made from top-grade weather resistant materials or they won’t last even a season. Therefore, you should always check the device’s damp rating first. You’ll need to look for items UL-listed for wet locations. This information should be provided in the product’s specifications. Note that many leading manufacturers offer both indoor and indoor/outdoor options of the same models. Always check the markers on the package in order to be sure that you got the right one. Make sure that the fixture you buy has the capacity for the lights you want to use. The majority of fans come with standard medium-sized 40W bulbs, but you can replace them with anything you’d like as long as it fits. 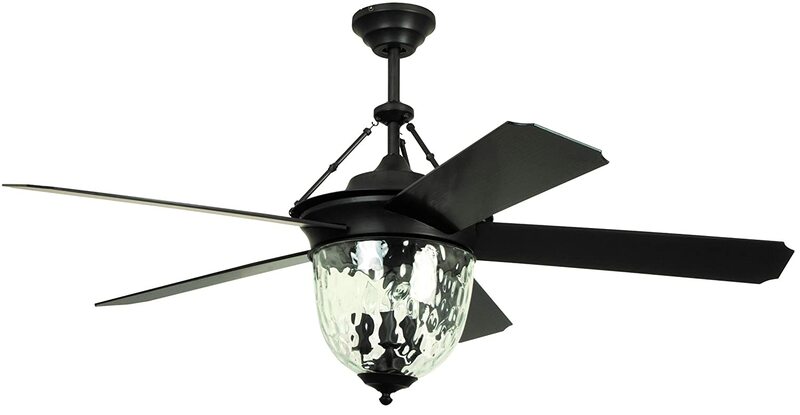 Outdoor fans with lights are fairly large as they must have big blades and powerful motors to offer maximum comfort. Look for Energy Star models and an opportunity to switch to LED lights for maximum savings. Luckily, products from the leading manufacturers are highly efficient by default. Size and number of the blades affect the airflow, so you’ll need to get larger models if you want to keep a big patio reasonably cool in the summer. If you don’t have an opportunity to install a fan with blades over 50 inches, you’ll need to choose smaller models with more powerful motors. Everyone can find the perfect outdoor ceiling fan today because there are dozens of designs available. Regardless of whether you need a fixture for a Victorian-style patio or for an ultra-modern sunroom, you’ll be able to get it if you look through the available options. Decide on the design you seek beforehand as you might fell a bit ‘lost’ when you start studying the market and see the range of the available options. When shopping for the best outdoor ceiling fans with lights, be sure to verify the weather resistance rate of the piece, especially if you live somewhere extremely humid. You also need to check whether the power of the fixture would be sufficient for the space. A larger fan is usually the best choice for outdoors.